After a town hall Monday night in Sioux City, Iowa, Democratic Sen. Cory Booker became something of a history teacher, showing students a performance of "Bohemian Rhapsody" by Elton John and Axl Rose from 1992. Booker sang along, and he was approached by Brylie Ruden, a self-described Queen mega-fan who was wearing a "Bohemian Rhapsody" T-shirt. The New Jersey senator talked her and two other students through the history behind one of his "favorite scenes ever." "The two of them had some beefing going on," Booker said. 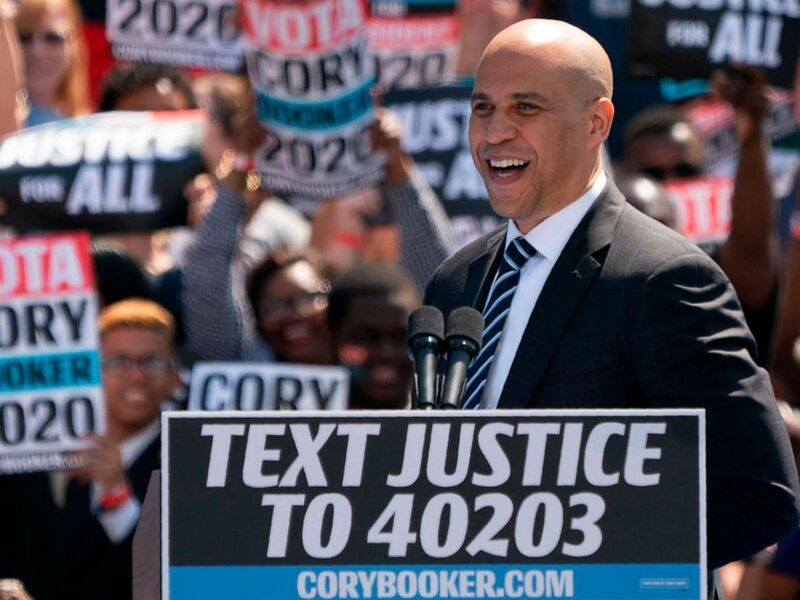 Presidential hopeful Cory Booker addresses his "Hometown Kickoff of the Justice For All Tour," April 13, 2019 in Newark, N.J.
Elton John and Axl Rose performed at London's Wembley Stadium to honor Freddy Mercury just months after the legendary Queen front man died of complications from AIDS. "Look at Axl Rose come out. ... Now watch the crowd," Booker told the group. "Imagine you were there -- 100,000 people on their feet going crazy!" Booker only tripped up once on the lyrics, mostly keeping up whenever he jumped in to sing a few lines.